Leslie Bassett, a Pulitzer Prize-winning composer known for his lush sonorities and ecumenical instrumentation, died on Feb. 4 in Oakwood, GA. He was 93. A master orchestrator who could coax a vast range of tonal colors from the bits of wood and brass for which he composed, Mr. Bassett wrote works for symphony orchestra, chamber and choral ensembles, solo instruments and voice. 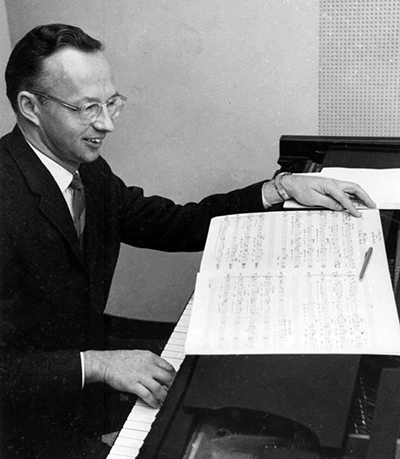 At his death, he was the Albert A. Stanley distinguished university professor emeritus of composition at the University of Michigan, where he had taught from 1952 until his retirement in 1992. Mr. Bassett received the Pulitzer in 1966 for “Variations for Orchestra,” which had been given its United States premiere by the Philadelphia Orchestra under Eugene Ormandy the year before. Over the years, Mr. Bassett’s compositions were performed by the New York and Los Angeles Philharmonics, the Chicago Symphony, the Cleveland Orchestra and the Juilliard String Quartet. Leslie Raymond Bassett was born on Jan. 22, 1923, in Hanford, CA, and grew up on ranches in the San Joaquin Valley, where his father raised hogs. As a youth he studied the piano, trombone and cello, as if anticipating the eclectic range of timbres on which his work would draw. During World War II, he served in the United States and in Europe as a trombonist and arranger with the 13th Armored Division Band. Mr. Bassett earned a bachelor’s degree in music in 1947 from what was then Fresno State College (now California State University, Fresno), followed by master’s and doctoral degrees in composition from Michigan. He studied composition in Paris with Nadia Boulanger and Arthur Honegger; he later studied electronic music with Mario Davidovsky. His other compositions include the Concerto for Alto Saxophone and Orchestra; Concerto da Camera, for solo trumpet and chamber ensemble; “Narratives,” for guitar quartet; vocal settings of texts by William Blake and Edwin Arlington Robinson; and many works for wind and brass ensembles. Among his other laurels are the Rome Prize, a prestigious award for composition; Guggenheim fellowships; and a Fulbright fellowship. Mr. Bassett lived most recently in Flowery Branch, Ga. His survivors include his wife, the former Anita Denniston, whom he married in 1949; a son, Noel; a daughter, Wendy Bratton Baker; two grandchildren; and three great-grandchildren. Another son, Ralph, died in 1967. In a 1987 interview with the music journalist Bruce Duffie, Mr. Bassett spoke of the difficulties that living composers — even Pulitzer Prize-winning ones — confront in making their work known to a wider public.